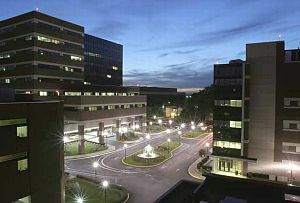 Hackensack University Medical Center (Hackensack UMC) is a 775-bed non-profit, research and teaching hospital located seven miles (11 km) west of New York City, in Hackensack, New Jersey, providing tertiary and healthcare needs for northern New Jersey and the New York metropolitan area. HUMC is New Jersey’s largest provider of inpatient and outpatient services and is the fourth largest hospital in the nation based on admissions. HUMC is affiliated with the New Jersey Medical School of UMDNJ (University of Medicine and Dentistry of New Jersey). The medical center was founded in 1888 with 12 beds as Bergen County‘s first hospital. Hackensack University Medical Center is Bergen County’s largest employer with a work force of around 7,175 employees and an annual budget of $1 billion. The hospital’s staff of 1,400 physicians and dentists covers the full range of medical and dental specialties and subspecialties. Hackensack University Medical Center has been designated as a magnet hospital since 1995 after it became the first hospital in the country to receive the Magnet Award for Nursing Excellence by the ANA. HUMC is a state-designated New Jersey Children’s Hospital and a full-voting member in the National Association of Children’s Hospitals and Related Institutions (NACHRI). HUMC is also a member of the Association of American Medical Colleges‘ prestigious Council of Teaching Hospitals and Health Systems (COTH). The Cancer Center at Hackensack University Medical Center is New Jersey’s largest and most comprehensive and is among the nation’s top 10 in patient volume. The Cancer Center’s Adult Blood and Marrow Stem Cell Transplantation Program is one of the top eight in the United States. The hospital is a member of the Planetree Alliance, a nonprofit association of health-care institutions set up to promote practices to make patients less intimidated and more comfortable with the health care they receive. On August 1, 2007, Hackensack University Medical Center became a smoke-free campus. Both patients and employees are not allowed to smoke anywhere on the campus grounds. 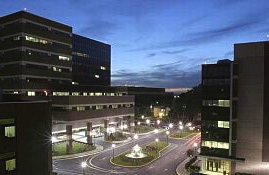 On February 23, 2011, Becker’s Hospital Review listed Hackensack University Medical Center under the 50 Best Hospitals in America.